#Feminism is having a second print run! Pelgrane Press is publishing a second edition of the print and digital books. And now, that's where you can pick up copies of our project. For more information, visit Pelgrane here. Looking at the world through a feminist lens reveals absurd, tragic, and fascinating situations. Written by feminists from eleven different countries, #Feminism offers bite-sized takes on contemporary feminist issues. Each of the 34 nano-games in this collection requires between three and five participants, simple (if any) props, and up to an hour of play time. The games range from silly to serious, including scenarios about selfies and rom-coms as well as reproductive rights and domestic violence. And of course, enjoyment has no ideological boundaries—there are games here for participants new to feminism as well as those experienced in making gender arguments on the internet. 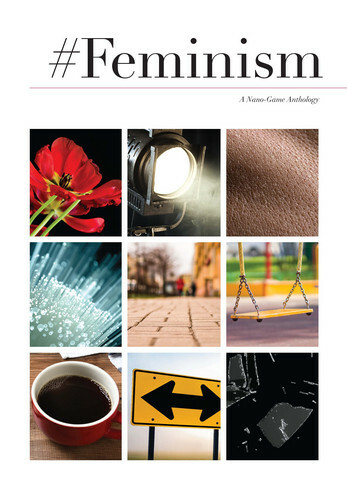 Read more about the games and track the travels of the anthology at feministnanogames.wordpress.com. We created this anthology to inject feminist discussions into the (analog) gaming spaces we already occupy, as an introduction to feminist issues, and to help persuade communities that don't traditionally game to get into the hobby. We also created it out of frustration. In many tabletop roleplaying, freeform, and larp communities, the old adage holds true: art about men's experiences is viewed as being "about humanity," while art about women's experiences is "for women." And often, women's lives are not represented at all. We wanted to create space for art that reflects our lived experiences, so we asked our designers to make games about feminist issues that are important to them right now. We also used the collection to help connect feminist game designers across international boundaries, and to help support and encourage first time designers to make games. Joined together in a collection, we make a bigger impact than any of us would make on our own. Our participants are active members of analog roleplaying communities across the world. Some are professional, award-winning experience designers, while others are devoted hobbyists new to game design. They are scientists, professors, journalists, art administrators, students, and more. Everyone volunteered their time and effort. We chose the nano game format because it has a small social footprint, requiring minimal prep and props, which lowers barriers to participation. We hope they present thought-provoking takes on gender relations in the 21st century, and serve as a starting place for many discussions.